Like Val Lewton in the 1940s, Gareth Edwards could be accused of pulling a fast one. Lewton was influential in creating cheap b-movies with evocative titles that were actually intelligent character pieces. Likewise Monsters is severely lacking in actual monster action and cannot be dismissed as a basic crowd pleaser. Instead a very real present day world that is dealing with unusual “creatures” merely forms the backdrop for a road movie as photo-journalist Andrew (Scoot McNairy) chaperones his boss’s daughter Sam (Whitney Able) through the Infected Zone of Mexico and back into the US. Actually, even the road movie is a cover for what boils down to a romance, a trick Hitchcock would frequently employ. Lewton? Hitchcock? These are the fathers of modern genre cinema! Who the heck does this Gareth Edwards think he is? As a debut, Monsters is incredible. As Neill Blomkamp did with District 9, Edwards brings special effects experience and a genuine talent for film-writing on a shoestring budget, but even so, that doesn’t account for his ambition. Monsters has been compared to District 9, but apart from the loose premise (alien discovery leads to uneasy human tolerance of new species), that film is very much classic comic book material. It’s also reminded people of Cloverfield, but Monsters isn’t hooked on a gimmick and doesn’t treat its characters as lively monster munch. Frank Darabont’s adaptation of Stephen King’s The Mist stands as a finer example of using monsters as a backdrop for the human condition, however Monsters is distinct for its optimism. While it lacks set-pieces and gore, the detritus of fights with the creatures litter the route and create a sombre atmosphere. If anything, the film it reminds me more of is The Road. Again, I must stress the more optimistic tone though. Edwards has used real locations (albeit with occasional CGI retouching) and the story benefits ten-fold from that authenticity especially as he has a style similar to Cinema Verite. Mexico looks war-torn and you would swear an emotional moment following a street party in a village while the community mourn their dead is absolutely real. Toward the end, they make their way through a destroyed empty town which looks incredible. McNairy and Able’s understated performances are perfectly judged, especially considering there isn’t a single set-piece that distracts your attention from them. Throughout this is their story and theirs alone. It does have its moments though, particularly a nervy river scene where an obvious opportunity to mimic Jaws is sidestepped beautifully. For actual footage of the creatures, there are one or two fire-fights, but the money shot is wisely saved until the end. It’s magnificent and strangely beautiful, while also underlining the films only real problem. I think it’s a biggie: Monsters would be a better film without the monsters at all. If this were a war-time drama the exact same couple with the same backgrounds could have a similar journey, meet similar people and it might be better, more affecting for it. You could argue it would be over-familiar, but the emotional link between the misunderstood creatures (they are only aggressive when attacked by military) and the couple is so clumsily handled it borders on embarrassing. Science Fiction is usually metaphorical, but it just doesn’t work when it has to be forced. It feels like Gareth Edwards is a genuinely talented film-maker who perhaps started this project from an urge to use his own well practiced special effects in an authentic setting, but didn’t realise when his natural talent for writing drama sidelined his sci-fi premise and it became a crutch that needed forcing back in to be relevant. Still, as mistakes go, it’s a noble one! Don’t expect a gritty Jurassic Park thrill-ride, but go in with an open mind and there is much to admire. 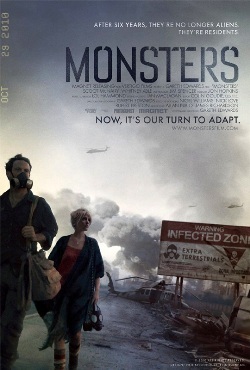 Monsters is a masterful film that demonstrates a more effective, restrained use of CGI than any of its contemporaries, from War of the Worlds to Cloverfield, while having a grasp of cinematography and editing so confident it could rival a political thriller like Syriana and lends the premise a “this could actually happen!” vibe. Ultimately it just isn’t exciting enough to support there being monsters at all and the heartfelt science fiction feels awkward. Still, hell of a debut and such a bold attempt at reshaping a genre, it could yet turn out to be a milestone. I look forward to seeing what Gareth Edward’s next project is because he’s capable of anything and could have a lot of mainstream directors running scared. I really want to see this. I didn't even know it was out anywhere yet. I'm not sure when it's released here. It's released this weekend here and according to IMDB, you should already have it. I was able to see it at a preview. My gut feeling is you will respond really well to it. It really is an astonishing film, just for an old sci-fi nut like me, I felt I spotted a few joins that let it down. That really feeds into what I was trying to say. I think he set out to make an unusual monster movie (he also said, "if Cloverfield was 9/11, this is Afghanistan", which really sums it up perfectly), but underestimated his own considerable talent for making a character based film and by the end, it was far more about them than it was about the monsters. He also had the unique chemistry of the two leads. I wasn't sure when writing my review, but I'd heard they were a real couple; they have since married! There is no moment of this film that feels fake and that kind of proves it. While Claudia and Danny on Film 2010, as I said, loved it and didn't seem to have the reservations I noted, but Claudia did describe the film as "unpredictable" which is an excellent point when taken in context. This film just feels so fresh. I just checked IMDb and it says it opened in Australia on the 25th of November. But then I checked the websites for the two cinemas in my town and it wasn't listed on either of them. I think I will enjoy it as well. I have been looking forward to it since I saw the trailers. I'm glad it seems to be getting good reviews. I want to see it as well. I think I might be a little disappointed by just how little monster there is. Not sure how it compares, but I thought that Cloverfield had a great balance as far as monster exposure goes. Glimpses throughout, to maintain the threat/presence and then a few money shots at the end. Obiously, Cloverfield's style is subject to taste. Turns out this movie is hardly showing anywhere at all! I looked through the showings of our two major chains of cinemas and I could only find it showing at one cinema in my state. That's rubbish! Films like this deserve a leg up because they are important. Put Cloverfield right out of your head, Achim. You're right it was a brilliant film and well balanced, as you say, but it was set-piece cinema. It's only aim was to create a thrill-ride, brush aside occasional plot holes, mercilessly use characters as fodder and even be a bit nihilistic. Monsters is a love story. Pure and simple. That comment from Gareth Edwards in my previous post is spot-on: "if Cloverfield was 9/11, this is Afghanistan"; a world that has changed and is struggling to deal with a new status quo. In a sense there is no ticking clock plot either, no immediacy. What happens around the couple is occasionally horrific, but actually routine and unresolved, except in their understanding of the creatures and each other. It's a special film. Cloverfield achieved what it set out to do very well indeed. This has ambition beyond that at the cost of basic monster bashing action. Hmm, it's looking like I might have to turn it into a day-trip if I want to see this one at the cinema.